The Snowdonia National park is just waiting to be explored. Fish the lakes and walk the mountains. Kayaking is a popular sport. 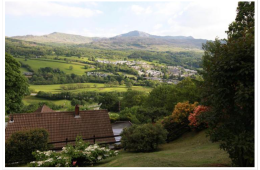 Dwy Olwyn bed and breakfast in Dolgellau, is a spacious family run guest house, which has offered b&b in Snowdonia for over 20 years. 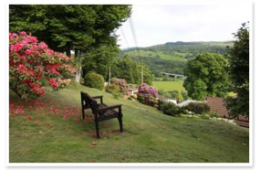 Our guests can expect a warm Welsh welcome and comfortable accommodation, that is south facing, in a peaceful location set in an acre of landscaped gardens yet only 10 minutes walk from the quaint market town of Dolgellau. Good home cooking – hearty or vegetarian option. 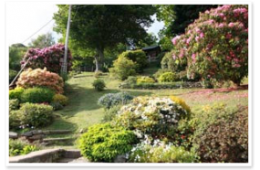 Dwy Olwyn is an ideal starting point for touring the whole of North Wales, with its beautiful scenery. 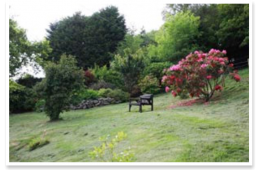 The images above are taken from the garden and patio, a lovely place to relax after a day of walking or touring. 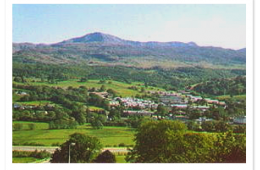 The Historic market town of Dolgellau is very near Dwy Olwyn and is an excellent base for touring, walking or cycling. Getting to Dolgellau is a scenic and straightforward journey by road. arge comfortable guest lounge looks out onto ‘ Cader Idris ‘ the second highest mountain in Wales. Here you will find a large selection of guide books, leaflets and maps for browsing through to help decide on what to see and do in the area. Also board games available for guest use. Dwy Olwyn is within the Snowdonia National Park, convenient for sandy beaches, pony trekking, narrow gauge steam railways, golf, fishing, Centre for Alternative Technology, RSPB sanctuary, and many picturesque walks including the famous Precipice Walk high above the beautiful Mawddach Estuary. 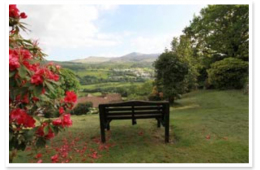 You will also find us on Wales Tourists Online in The Llyn Peninsula bed and breakfasts section.